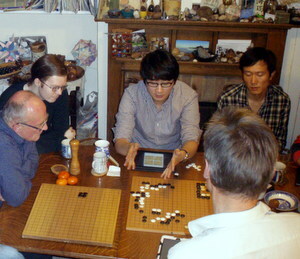 Bay Area Go Players Association held its Fall Go Tournament November 2nd in Berkeley, CA. Thirty nine players gathered for four rounds of play, free pizza, and a lunchtime discussion of go problems led by Matthew Burrall 7d. For the second tournament in a row, Naoyuki Kai 7d (AGA rating 8.61) (in photo at right) led the top division with a 4-0 record. “This time we added a fourth division so that more players would win prizes,” reports organizer Roger Schrag. While the top division had a strong field including Naoyuki, Redmond Cup winner Aaron Ye 6d, and USYGC winner Jeremy Chiu 5d, all strengths were well represented. Half a dozen high school students from Monta Vista High School in Cupertino came out to play, most of them in the 20 to 25 kyu range. In all, six kids and four adults joined the AGA at the tournament. Bay Area Go’s Winter Tournament is scheduled for Saturday, February 22nd, 2014, again in Berkeley. Details will be posted soon at www.bayareago.org. 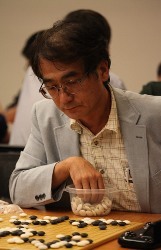 Winners report: First Division: 1st: Naoyuki Kai 7d (AGA rating 8.61). 2nd: Aaron Ye 6d. 3rd: Wei Cheng 6d. Second Division: 1st: Jay Chan 1d. 2nd: Marshall Quander 2d. 3rd: Yin Luo 3d. Third Division: 1st: Peter Pan 1k. 2nd: Yuanjie Chen 1k. 3rd: Julie Burrall 4k. Fourth Division: 1st: Rena Katz 16k. 2nd: Thomas Rike 6k. 3rd: Ben Matthews 7k. Honinbo League’s Second Round Nearly Completed: The first round of the 69th Honinbo League was completed on the last day of its specified month of October. In the fourth game, Cho U 9P (B) defeated Sakai Hideyuki 8P by resignation. Three of the four games in the second round were played on November 6. 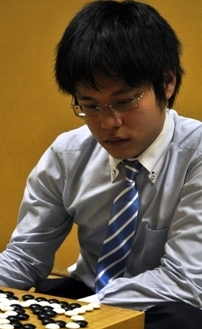 Yamashita Keigo 9P (B) beat Cho U by resig. ; Takao Shinji 9P (B) beat Sakai Hideyuki by resig. and Kono Rin 9P (B) beat Yo Seiki 7P by resig. Yamashita and Kono lead the league with two wins each. Takao and Cho are 1-1; Ida Atsushi 7P is 1-0; Yuki Satoshi 9P is 0-1; and Yo and Sakai are both 0-2. When he set a new record by winning a place in the league at the age of 18, Yo Seiki (right) was hailed as a coming star, but he has had a tough initiation into top-level play. Xie Catches Up In Women’s Honinbo Title Match: In the fourth game of the 32nd Women’s Honinbo title match, Xie Yimin faced a kadoban (a game that might lose a series) for the first time ever in this title. 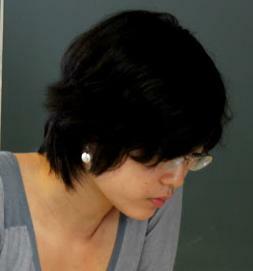 Xie had black and played steadily, forcing the challenger Mukai Chiaki to resign after 189 moves. That means that the title will be decided in the fifth game on November 27. Big Week Coming Up: There are some big games coming up this week. In the third round of the LG Cup, scheduled for November 11, Iyama Yuta will play Chen Yaoye of China and Takao Shinji will meet Tuo Jiaxi, also of China. The semifinals follow on the 14th. Back in Japan, the play-off to decide the Kisei challenger, between Yamashita Keigo and Murakawa Daisuke, will be held on the 14th. Three Promotions And A Retirement: A win by forfeit on October 31 secured Kato Tomoko a promotion to 6-dan with 90 wins as a 5-dan. The promotion took effect the following day. Born in 1969, Kato won the Women’s Honinbo in 1992, the Women’s Meijin in 1995, the Women’s Strongest Player in 2000, and the Women’s Kakusei in 2001. Wins on November 7 earned Fujita Akihiko a promotion to 4 dans (after 50 wins) and Takeda Yoshinori a promotion to 2-dan (after 30 wins). Both promotions took effect on November 8. Kawamoto Noboru 9P, born in 1941, retired as of October 31. He was a disciple of Masubuchi Tatsuko 8P, became 1-dan in 1961 and 9-dan in 1989. He won the 8-dan section of the 9th Kisei tournament in 1984. Tang Weixing secured his place in the 2013 Samsung Cup Final when he defeated Shi Yue 9p in Daejeon, Korea on November 7. Though he lost his first match, Tang’s keen eye and perseverance through games two and three led him to victory. Meanwhile, Lee Sedol 9p (left) had a similar journey on his route to the final. Korean fans worried when a misread in his first match caused Lee to surrender to opponent Wu Guangya 6p. However, he quickly recovered and sailed through games two and three. The finals will be held December 9-12 in Suzhou, China and broadcast live on Baduk TV. Defending champion Lee will be going for his fifth Samsung Cup title while Tang will be making his international debut. If Tang wins, China will close the year as winner of all the 2013 major international tournaments. Will Lee’s veteran status be enough to carry the flag for Korea? Tune in to find out! For more information on the 2013 Samsung Cup semifinals including photos, game records, and post-game interviews, please visit Go Game Guru. Russia: Ilja Shikshin 7d defeated rival Alexander Dinerchtein 7d in the Japan Ambassador Cup in Moscow on October 27 while Dimitrij Surin 6d placed third. Spain: The XIV Spanish Open finished on November 3 with Yue Li 5d (left) in first, Shizuo Kato 6d in second, and Ignacio Cernuda 3d in third. Sweden: Also on November 3, Antti Tormanen 6d bested Yaqi Fu 6d and Klas Almrot 4d came in third at the Gothenburg Open. Kim Sooyang and Jeon Junhak, representing Korea, won the 24th International Amateur Pair Go Championship, held in Tokyo, Japan from November 2-3. The pair (at right) won with five straight wins, after a close final-round game with Oda Ayako and Nagayo Kazumori from Japan. Lin Hungping and Lo Shengchieh, from Taiwan, were the runners up. Japan’s Oda and Nagayo finished in third place and were crowned the Japanese Amateur Pair Go Champions. The highest finishing team from outside of Asia were Natalia Kovaleva and Dmitry Surin, from Russia, who finished 4th. Olga Silber and Benjamin Teuber, representing Germany, and Irina Davis (née Suciu) and Lucretiu Calota, from Romania, also finished strongly – in 9th and 11th place respectively. Rita Li and Bill Lin, who represented Canada, finished in 19th place and the USA’s Amy Wang and Justin Ching finished 25th. Full results are available on the International Amateur Pair Go page. - David Ormerod, based on a longer article at Go Game Guru. Photo: Kim Sooyong (left) and Jeon Junhak, Korean representatives. Hwang In-seong (left) will be special guest this year at the London Open, the UK’s largest go tournament, which runs from December 28-31, ending with a New Year’s Eve meal and drinks (Upcoming European Tournament: London Open Go Congress, EJ 10/30). Hwang, a Korean national, was a yeongusaeng – the equivalent of a Japanese insei – although he never made pro status. He is now resident in Europe, where he is the second highest-ranked player on the European Go Database (after Fan Hui), graded at 8d* with a GoR of 2802. Eurogotv reported this week that Hwang will be in Berlin, Germany to play in the 16th Go to Innovation tournament November 22-24 – which he has previously won six times in a row – and the Berliner Kranich the following weekend. 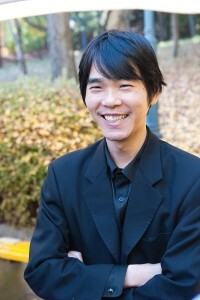 Click here for Hwang’s interview with Eurogotv in May this year, where he discusses, amongst other things, his decision to quit yeongusaeng, his move to Europe and his teaching activities, including his own Yunguseng internet go academy. 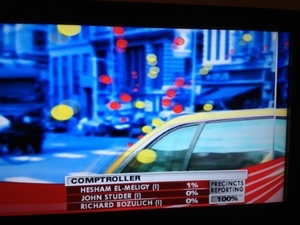 Report by Tony Collman, British correspondent for the EJ. Photos: (left) Hwang teaching, courtesy of Belgian Go Federation website; (right) Hwang gives a presentation on approaching life-and-death issues at an invitational event in October at the home of Oxford City Go Club Secretary Harry Fearnley; photo by Ruth Davis. *Although graded at 8d in Europe, Hwang styles himself as 7d since, as Harry Fearnley explains, in his native Korea no amateur is allowed a higher grade. A calendar mix-up resulted in a bonus meal at the Massachusetts Go Association’s Fall Tournament on October 20 in Somerville. When TD Eva Casey discovered at the last minute that the Boylston Chess Club was double-booked, she arranged for the tournament’s first round to be held at the Dragon Garden Chinese Restaurant across the street. The only “catch” was that players would have to lunch at the Dragon Garden, which they gladly did. 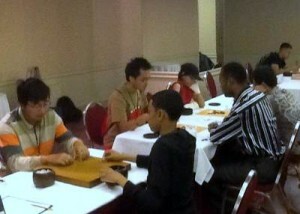 ” It turned out the Chess Tournament had low turnout and was over at 2pm,” Casey reports, “so we were able to share the chess space for Round 2, and had it to ourselves for Rounds 3 and 4.” A total of 27 players ranging from 20 kyu to 4 dan participated, and the three four-game winners were Steven Wu 4d (in striped blue shirt at front left), John Uckele 10 k and Chia Chan 5k. The AGA and the Las Vegas Go Club are hosting a two-day, four-round AGA-rated go tournament as part of MSI’s second Las Vegas Mind Sports Festival in December. The festival also features chess, scrabble and Magic: The Gathering, Dec. 7-8 at the Palazzo. To register or find out more information, contact Andy Okun at president@usgo.org. 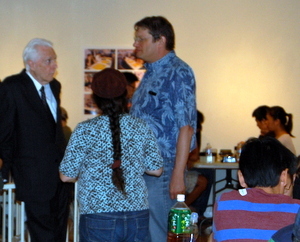 “It was a fun event back in July and should be better this time,” said Okun. 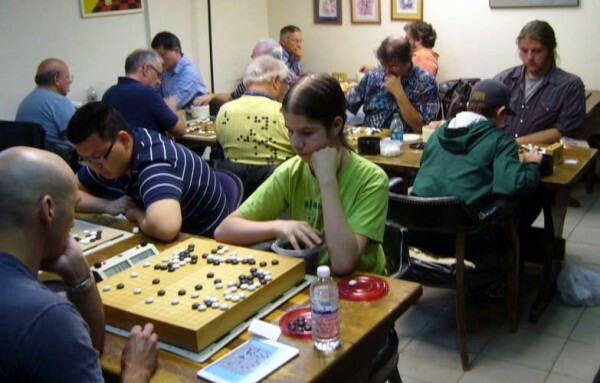 “Lots of gamers in attendance and we even had the chance to teach go to some kids and some chess players.” Arrive by 9:30 a.m. Saturday, rounds at 10 a.m. and 2 p.m. $100 top prize, others based on attendance. Best hat worn by a go player wins a box of Bendicks Bittermints.